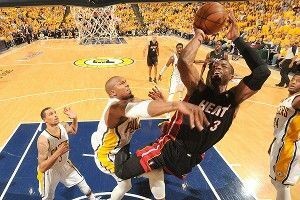 Dwyane Wade scored 40 points and LeBron James added 28 as the Heat advanced to the Eastern Conference Finals with a 105-93 win over the Pacers and a 4-2 series win. In the losing locker room, Tyler Hansbrough could barely contain a smile as he took a giant bucket of quarters out of his locker. “I guess I’ll see you losers at the arcade,” he yelled, strutting out the door. He poked his head back once to see if anyone was following him, but nobody was. Dan Haren struck out 14 and Albert Pujols hit his 450th career home run as the Angels shut out the Mariners 3-0. “We’re creating such memories!” cried the Mariners players, as they celebrated on the field with the Angels. At the first Jets workout of the year, Tim Tebow was used as the “protector” on the punt team. “Can we say ‘savior’?” asked Tebow. “It just has a nicer ring to it.” Rex Ryan vetoed the idea, but said he could call himself “Pastry Chef” if he wanted. The confused players started to ask what he meant, but Ryan was already off looking for pastries. Giants receiver Hakeem Nicks fractured his right foot while running a route during an offseason workout. As he watched his receiver writhe in pain on the ground, head coach Tom Coughlin quietly crossed out the “Zig Zag Crazy-Stomp Bumpy Terrain Twisto-Turno Stork Stand Kicky-Kick” route in his playbook. NFL players union chief DeMaurice Smith told reporters that his organization’s claim that the league and its owners colluded on salary cap matters in 2010 will hold up in court. “Objection!” shouted Roger Goodell, as he dramatically strolled into the room, followed by three cameramen. “I’m filming a reality show,” he whispered. “Overruled!” shouted Donovan McNabb, dashing into the room with a producer behind him. “I’m trying out for a reality show,” he whispered. “This court is adjourned!” shouted television judge Greg Mathis, entering the room with a flourish. “I need to boost my ratings or they’ll take my house,” he whispered. Justin Masterson outdueled Justin Verlander as the Indians won 2-1 to sweep the Tigers.”YOU’RE BOTH MY SONS!” said 60-year-old Justin Morgenthau, who chooses to pass down his first name to his sons, and who yells all the time. Rookie catcher Devin Mesoraco hit his first career grand slam as the Reds finished a four-game sweep of the Braves with a 6-3 win. “You know what that means, rookie!” said Reds slugger Joey Votto in the dugout. “Four postgame spanks!” The other Reds quietly told Mesoraco that no, that’s not what it meant, and he should probably stay away from Votto for a while.